"This is my absolute favorite quinoa recipe! It's so flavorful and always a big hit with my family and friends. Trust me, you'll want to eat every single bite!" Bring broth and quinoa to a boil in a saucepan. Reduce heat to medium-low, cover, and simmer until quinoa is tender and water has been absorbed, 15 to 20 minutes. Transfer quinoa to a large bowl and set aside to cool, about 10 minutes. 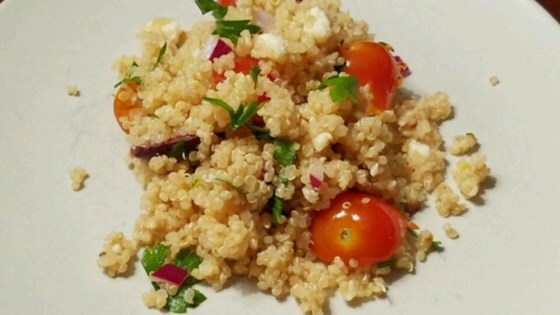 Mix tomatoes, parsley, kalamata olives, onion, feta cheese, olive oil, vinegar, and garlic into quinoa. Squeeze lemon juice over quinoa salad, season with salt and pepper, and toss to coat. Chill in refrigerator, 1 to 4 hours. Great for lunch or a light supper and packed with flavor! Made this tonight and I am a quinoa lover. This was amazing!!!! My 17 year old daughter hid the leftovers from me and told me I can't take it to work. I will find it!!! As recommended by others, I used 1/2 the quinoa and it was still a lot of quinoa. My Bunco guests seemed to enjoy it, but I would not bother making it again. Great recipe! It was my first time mincing garlic and cooking quinoa, and it turned out perfectly! I also added cilantro and avocado to it...thanks for the recipe.